Why Athletic Training: Heath always had a passion for sports, but when he was younger, was not always able to participate due to injury. He wanted to still be involved in sports, and through his personal experience with his high school athletic trainer, found a way to make that possible. Mentors: Robbie Stewart; “He taught me most of what I know as an athletic trainer, but he also taught me valuable lessons about life in general.” Heath says Robbie was his “AT dad”. Heath found athletic training in high school. He has always had a passion for sports, but wasn’t always able to participate in them due to injury. Both his junior and senior year of high school, Heath experienced injury that ended the season for him. During that time, his high school’s head athletic trainer, Penny Head, made him fall in love with the process of getting an athlete back to 100% after sustaining an injury. At that time, Heath says he figured that if he couldn’t be on the field as an athlete, then he would like to be involved as an athletic trainer. Heath recalls so many memorable moments as an athletic trainer that he couldn’t choose just one! He says that winning the 2018 Football State Championship this past year was a great experience. He says, “just to see the look of pure joy on the athletes’ faces knowing what they had overcome throughout the year - with some tragedy earlier in the year - and injuries they battled was awesome to see”. While a graduate assistant with Arkansas football, some of the guys on the team threw him a surprise going away party and about 15-20 guys on the team showed up to thank him for everything he had done the past two years. That was something he remembers as very special. 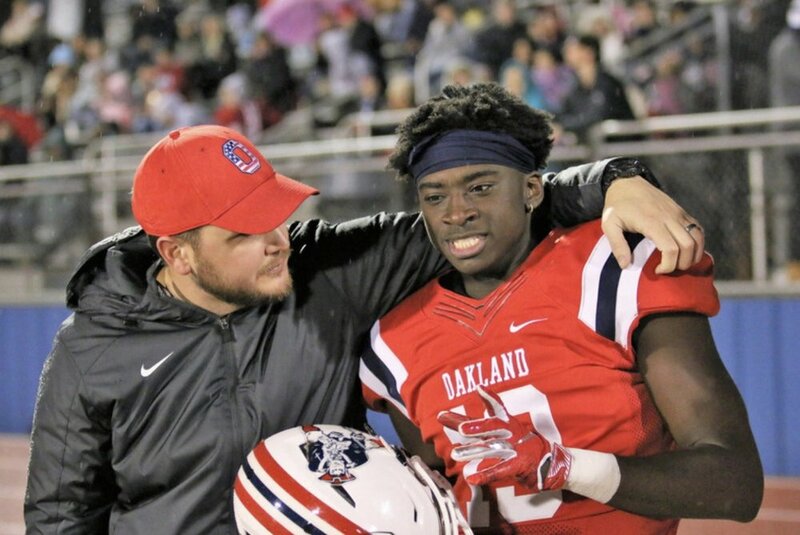 He felt that athletic trainers may not always get the credit or glory that comes with working in sports, but the athletes appreciate athletic trainers and at the end of the day that is all that matters. He is still in contact with most of those athletes today. Heath is one of the Health Science Instructors at Oakland High School. He has been a Health Science teacher for the past three years and teaches Health Science Education, Rehabilitation Careers, and Exercise Science. Heath is one of the advisors of the Career and Technical Student Organization HOSA Future Health Professionals at Oakland. He assists students who wish to enter the healthcare field by preparing them to compete against other students in regional, state, and national competitions. When asked how he spends his “days off”, Heath says he spends most of his time running errands that people with normal job hours can do on a daily basis like go to the grocery store, fix things around the house, catch up on sleep, and watch TV shows with his wife. When Heath isn’t at Oakland he enjoys playing golf on the weekends, going to the lake in his boat with friends, and attending NASCAR races whenever possible.